Here is a breakdown of my top 10 most wished for destinations in 2017. Please note that this list is in no particular order. At the end of the day, I’m willing to go anywhere and everywhere. There is just so many places everybody has to visit in their lifetime and here are 10 that stands out the most! Well to start off, Thailand is usually where most travellers begin. There’s just so much to do and see while maintaining a budget friendly experience. Thailand is just bursting with culture and traditional foods that you’ll never find anyplace else. You can find extraordinary temples and monasteries scattered all across the country! 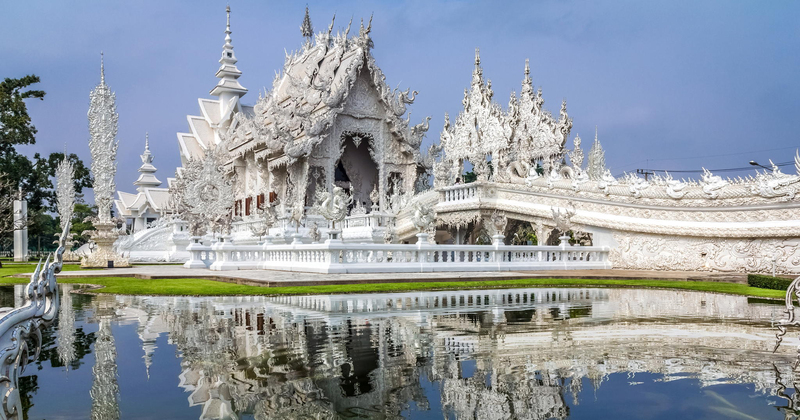 Whether you enjoy the city life of Bangkok, or a city bursting with history like Chiang Mai. There is definitely something for EVERYONE! Be sure not to miss the islands of Thailand. Some of the most popular destinations are on Phuket Island and Phi Phi Island. At the end of the day, Thailand would a wonderful experience for any traveler and would definitely hope to squeeze this destination into my 2017! Dubai is truly a growing mecca in today’s society. After completely blowing the world away with its recent record setting architecture, such as the Burj Khalifa. They aren’t stopping anytime soon with plans to shatter its own record! Other than the tallest tower in the world, Dubai is a striving tourist paradise. I was certainly hooked when they started building their own man made islands known as the Palm Islands. These man made islands were created to increase the city’s coastline! That’s crazy, isn’t it? On the other hand, Dubai is certainly no place for the budget traveller. So this destination is best enjoyed with some financial stability so you can explore everything the city has to offers. It would definitely be a dream to stay at the world famous Burj Al Arab hotel which can range anywhere from $2,000-$24,000 a night! At this rate, I’d be glad to spend a night at any hotel on the Palm Jumeirah; the first fully completed island. This is certainly a place you will have to visit in the future. Just like Dubai, the Maldives don’t come any cheaper. This is unquestionably a luxury destination for the few. To start off, the Maldives are a bunch of small islands located in the Indian Ocean. They can be compared to Hawaii but much more exclusive and less residential. This is truly a tourist destination that thrives on their natural beauty. You’ve probably all came across pictures of this exotic destination but haven’t realized. Just look below. The Maldives is absolutely stunning and I hope to make it one of my stops this year! I’m sure this is a destination that will eventually end up on everybody’s travel list. No matter what age, eventually you’ll find an inner desire to visit the capital of Japan. There’s just something special about this Japanese mecca that makes one want to experience it in person. Everything is just so vibrant and full of life. In addition, Japan has an extremely deep culture that could be eye opening to the outside world. Plus, who doesn’t want to eat traditional sushi? It also doesn’t hurt that Tokyo happens to house a Disney theme park. Currently, I am only missing 2 Disney Theme parks in the world, with this being one of the last ones. A visit to Tokyo’s DisneySea theme park would certainly be one of my must dos. Well… my reason may be different than most people. Once again, I really just want come here so that I could check Disneyland Hong Kong off my Disney list! But I’m sure the city looks beautiful as well? Singapore, Singapore, Singapore… what more can I say? There’s actually not much I could say about this place besides the fact that it’s a destination I’d love to visit. If that does happen, I’d love to stop by the famous infinity pool at the Marina Bay Sands Hotel. You know, the one picture you see on Instagram all the time that shows somebody swimming at the edge of a building. Other than that, there just so much more to love about Singapore! I’m a huge fan of a tropical climate and being right on top of the equation definitely helps out that clause. It is also a very multicultural English speaking Asian country due to their English roots. If I’m ever in the area, I’d definitely make Singapore one of my top priorities! Once again another destination in Southeast Asia, starting to see a trend? Anyways, Bali is just beautiful, as with most places on this list, but this place is certainly special. With a great range of affordable hospitality to extremely luxurious hotels, it’s surely a destination anybody can visit. They have some of the most unique experiences while maintaining an extremely cultured inland environment. This is definitely one stop I do not want to miss in 2017. Out of all the places I’ve been, I have never visited South America before. This is surely one country I’d be thrilled to explore. Just Machu Picchu alone would make gravitate to this country. Machu Picchu is an ancient Inca city located high in the Andes Mountains. It is one of the 7 wonders of the world! Overall Peru, would make a great South American Destination that I cannot wait to explore one day! I have always been thrilled with the sights of animals and rare wildlife. The Galapagos Islands just off the coast of Ecuador are a nature fanatic’s paradise. This is the same place Charles Darwin first developed his theory of natural selection. The Islands have many species that cannot be found anywhere else in the world which makes it so unique in itself. Currently the Galapagos has more tourists visiting than they can sustain. This is definitely once place to visit before mass tourism takes over indefinitely! Iceland seems to a very popular destination in recent years and I can definitely see why. So… I’ve actually been to Iceland, twice to be exact, but only enough to do a quick excursion each time as I was there just to catch a connecting flight. Check out my time at the Blue Lagoon over here! Unfortunately, I wasn’t able to spend much time exploring the whole island, which is an adventure in itself. From whale watching to waterfall hunting, there’s something unique about Iceland. Maybe it’s the fact that it was forged from volcanoes long ago and beautiful black beaches can be found all around the coast. Iceland is definitely a natural paradise. Also a great place to take pictures of beautiful landscapes and breathtaking mountains that could not be found anywhere else. If you’re going to Iceland between the months of September to April, you might be lucky enough to catch the Northern Lights also known as the Aurora Borealis. It’s a spectacular natural light show that is caused by disruptions of solar winds in our atmosphere. This is truly something you would have to experience first-hand! So where will 2017 take me? Who knows. Maybe I’ll be fortunate enough to visit every place on this list or maybe things don’t turn out as planned and I go a completely different route. Only time will tell. Please feel free to subscribe to my newsletter below and follow me on social media to be updated about where I’ll be this year! Thank you Usamah! Appreciate your kind words 🙂 wish you all the best! Peru is wonderful. We went a couple years ago. Iceland is on our list for this year – we just need to get the timing right with the kids. I’ll be back to your blog. I’m planning a Trip to Iceland this year also. I can’t wait! Love all of your travel picks! Being an avid traveller I can really appreciate all the thought you took into making this list! Hope you make it to them all! These are all great places! Iceland is definitely a popular destination, but I think it’d be so cool to visit. I’ve been to Tokyo and Hong Kong. Both are great places to visit! OMG the photos are stunning. I don’t know which place I want to visit the most! Great list! Galapagos and Iceland are at the top of my bucket list, and Tokyo is not far behind them. I hope to make it to at least one of those destinations this year. love the photos, love the destinations, beautiful options for travel I won’t get too far this year. Interesting. I don’t agree with every inclusion on your list (Thailand), but you certainly give some food for thought. Curious about one thing, though. There is a not a single destination in Europe and North America. Spain, Portugal and parts of Italy are perennial and don’t have to break the bank money wise. Apart from that, I’d probably add Iguazu Falls (Argentina and Brazil) in South America, but that’s just me! Makes me want to visit all of these places. I am wanting to travel to Thailand so bad! Ugh and the gorgeous pictures make me want to even more! Jesse, this is a great list! There are lots of places on here that I also want to visit, but I never considered Iceland. May have to reconsider. Leaving for Oahu tomorrow to stay at Aulani. I see you are a Disney fan as well. Cheers! Machu Picchu is great! I hope you make it there. Wow, it looks like your 2017 will be an incredible travel year! There are a few places on this list I wish we could make it to this year including Iceland and Hong Kong! We have been to Bali twice now and love it, it’s such a photogenic place! Hope you enjoy your travbelling 2017! Iceland is fantastic, but very expensive! Out of these I have been to Thailand, Indonesia, Dubai, Hong Kong, Singapore. All the best for 2017. I’m sure you’d be able to achieve it. I’m going to Thailand this month after I’ve been to Iceland so there are 2 from your list. Whilst I’m in Thailand I’m going to try get a cheap flight to the Maldives. I have been to the Silver Temple in Thailand so recognize your photo! Great list! I would love to visit any of these locations. All of the locations are so beautiful. I’ve always wanted to check out Disney in Hong Kong. This is a great list! Dubai, Peru, the Galapagos, and Tokyo are on my travel wish list as well! Some are more budget friendly than others; either way, I’ll have to get my stuff in order so I can cross a few off my list. I hope you can cross them all off your list this year! Of that list, I’ve only been to Tokyo but I’d love to go to any of them on there! Iceland would be pretty great to see, but I would also really enjoy seeing Peru! Oh gosh. These photos are giving me all of the wanderlust! The Maldives and Tokyo are both on my travel wishlist, but nothing will surpass my lust for travelling to Paris first aha. The world is so full of so many places to see. I haven’t left America a lot but I would love to see some more of these places. I am planning to travel to north India, from south, by car. The aim is the himalaya, spiti valley and dharamshala for instance. Some friend are doing Bali too, I wouldn;t mind going there too but I prefer places with no tourists. Offbeat is my thing. These list are really a must visit places! Well, so many beautiful places a country has to offer. I love to travel the world see all of the wonders. Iceland has been on my bucket list for a long time. It’s one of the first places we plan to go when we get out of debt! All of these look like fantastic places to visit. It strokes the wanderlust in me! I hope you get to go to all of these one day! These places all look amazing and I love the great pictures. If I could only go to one of them this year I would be happy. I definitely need to do more traveling. All of these destinations sound and look AMAZING! I would love to go to any of them at any point. I can’t even pick just one. Iceland, definitely Iceland. These pictures are incredible. Thank you so much for sharing! 10 PLACES!!!! Super ambitious! Good for you. Love all the choices and to me they seem like another persons reality 🙂 so can’t wait to here all about your travels this year!! Thanks for posting. I want to go to Iceland! My heritage is there so I would love to see it! Your pictures are beautiful! I highly recommend Bali, there’s no other place like it!! Great post, really enjoyed reading it! Amazing selection! I am going to a few of these this year such as Thailand and Indonesia but so many more are on my wish list, such as Ecuador and Maldives! Thanks for sharing! All these destinations are awesome! I wouldn’t know which one to choose!